The sleepy village of Xiabanliao, located just southwest of Tianluokeng village and Shuyang Town, has been the home of the Liu clan for twenty-five generations. And, when you take in the lush greenery of the surrounding mountains and listen to the soft bubbling of nearby brooks, you’ll understand why they’ve stayed for so long! Yet Xiabanliao isn’t just your ordinary Chinese village; it houses one of the most magnificent architectural wonders the country has to offer. The Tulou of Fujian are huge earthen fortresses that were designed to protect inhabitants from bandits. They have enjoyed great fame in recent years due to their unique appearance and unmatched fortitude. 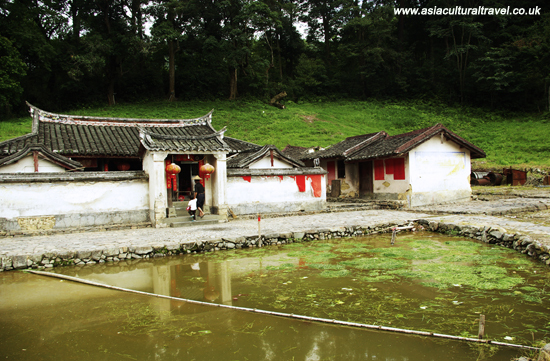 Xiabanliao’s Yuchang Lou, which was built by the Liu clan in 1308 during the Yuan Dynasty (1271-1368), is one of the oldest and most resilient of them all. At the grand old age of 700, this tulou is still home to 23 families and about 120 people from the Liu clan. It may not have all the modern conveniences of a new home, but at least the Liu family never have to worry about a mortgage! 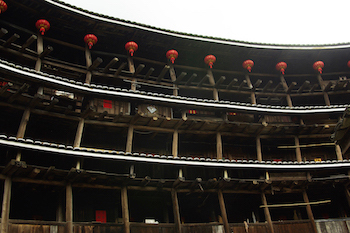 It towers in at five-storeys in height and 36 metres in diameter, making it is the tallest tulou in China. In spite of its age, the 25 kitchens on its ground floor are all equipped with their own private well, making it the only tulou in existence with such a convenient water supply. With 250 rooms, 25 kitchens, and a spacious courtyard in the centre, Yuchang Lou is so roomy that it could almost be called a village itself! In recent years, it has earned the alternate name “the zigzag building” because the wooden post structure within the tulou, which is meant to be vertical, appears to zigzag left and right on the 3rd and 4th floors. This bizarre phenomenon was not intentional but was in fact due to an error made in measuring the building materials. Don’t let the unsteady appearance fool you; this tulou has survived more natural disasters, wars, and sieges than you can count!